Gott Heart Art: Snowflakes Gone Wild! This is the title to one of the challenges and I went with it. Bah! Humbug! challenge is to use new/nearly new stash, with some of my Christmas money I got the Spellbinders Create A Flake One, Martha Stewart's Snow Flurry punch, you can do a corner or straight with this punch, pretty cool. The nearly new that I unearthed from some rearranging is my VersaMark Frost Dazzles ink pad. I don't think it shows, but I inked with dazzles ink then the light blue chalk ink and stamped all those snowflakes on the background, then heat set, they slightly sparkle. Saturday Spotlight SSHP14-Snowflakes gone Wild! Creative Card Crew Challenge Challenge 43-Punch It! Supplies: White Card Blank 5" X 7" Paper Wishes, Papers: my scrap stash, Stamp: The Paper Studio-Snowflakes, Ink: ClearSnap Color Box Chalk Ink, VersaMark Frost Dazzles ink pad, Martha Stewart-Snow Flurry punch, Cuttlebug embossing folder-Snowflakes, Spellbinders Shapeabilities-Create A Flake One, ribbon-Hobby Lobby, snowflake brad that I put glitter on, Chalks, glue dots. What a pretty Christmas card i love the colours and fabulous punch details. Thanks for taking part in the CCC Challenge. ooooooooooooh so jealous I love that snowflake die but I keep having an arguement with myself that I shouldn't buy it because I already have some other snowflakes! I do love it though. Your card is great Beverly - and it's fab to see you joining in again at Bah! Humbug! 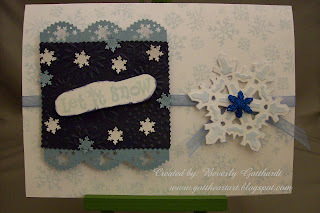 What a great winter card with the snowflakes and color combo. Plus, what a way to combine challenges! Thanks for playing along with Sketch Girl! Yep! A flurry of snowflakes indeed, like how you have blue and white ones for added effect. Thank you for joining in again at Bah! Humbug! Beverley. Oh I am so jealous of your Spellbinders snowflake die, it's gorgeous. Great use of cololurs and sketch. This is gorgeous Beverly. A well thought through design. Love those pretty papers and the beautiful fancy edges. Thanks for joining the One Stop Craft Challenge. Cute card and great job combining so many challenges! Thanks for joining us at Sketch Girl! Excellent combination of challenges and such lovely colours. Plenty of fancy edges here too! Thank you so much for joining our challenge at One Stop Crafts! THe blue and white is the perfect wintery color with all your snowflakes. Beautiful Christmas card. Thanks for joining us at the Sat. Spotlight this week!! So so pretty! Love all the snowflakes! thank you for playing along in the Sat. Spotlight and the Creative Card Crew! !